Farm Pigs for Inflation Profits! 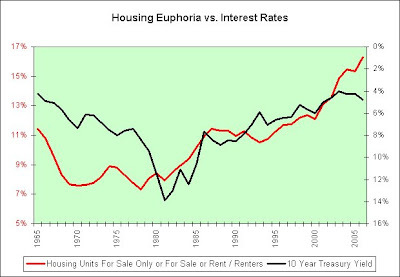 Housing Euphoria vs. Interest Rates? What Did We Import/Export in August? Slipperiest Rentals on the Planet! Hottest Property on the Planet! Profit Off Your Own Demise! Poll: The Year of the Financial Reckoning? Poll Results: What Interests You? BEIJING, Nov 1 (Reuters) - China unexpectedly raised domestic gasoline and diesel prices by a tenth on Thursday, the first increase in 17 months, as officials rushed to tame a worsening supply crisis by easing losses at state refiners. 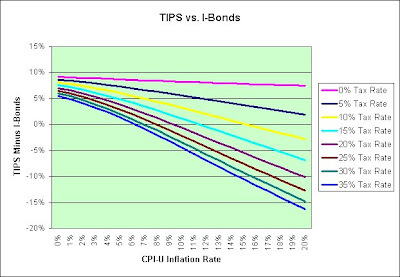 This is an update to my last post showing the comparison between TIPS and I-Bonds. These charts show what happens if your holding period is 10 years instead of 30 years (thereby reducing the benefit of the I-Bond's 30 year tax deferred nature). Once again, this is not investment advice. This is a chart of an I-Bond purchased today and held 30 years. You don't have to hold it 30 years but you can (that is an added bonus). It is tax deferred while you own it and that's what makes the low 1.3% real yield worth thinking about. Tomorrow we'll be getting a new rate (or the same one) and it will apply to all I-Bond purchases made over the next six months. I'm planning on buying again in January, for what it is worth. 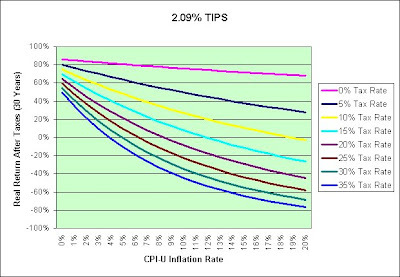 This is a chart of the 10 year TIPS. In order to make it comparable to the 30 year I-Bond you must continually reinvest any proceeds. It is assumed in this chart that you can get the same rate you can now (for better or worse, it is not necessarily a good assumption). TIPS are not tax deferred. Should inflation rise, those taxes would really start to hurt (depending on your tax bracket perhaps especially so). This shows the breakeven point. 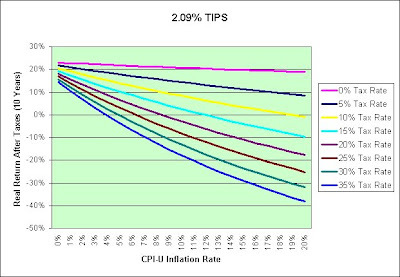 As you can see, TIPS pay better if inflation remains relatively low (and also do better if your tax rate is low). 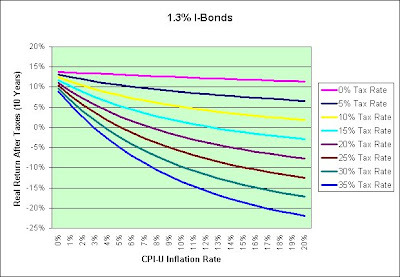 I-Bonds do much better by comparison if inflation doesn't remain relatively low (and also do better if your tax rate is high). This analysis is only valid if you hold 30 years. 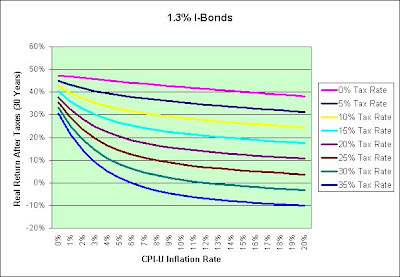 I-Bonds do progressively worse if you sell them early. You wouldn't be getting maximum benefit out of their tax deferred nature. Further, you can't sell I-Bonds in the first year and you are penalized three months interest if you sell them before five years. This analysis also assumes inflation is a constant over the period. The breakeven point would be more favorable to TIPS if inflation slowly rose as opposed to simply jumping higher in the morning. And lastly, if you don't believe the government's CPI numbers are close to reality, then this would obviously not be something you'd be interested in. That's for each person to decide for themselves. I happen to be in the camp that believes the CPI is relatively accurate. For each thing I see rising in price, I can find something that isn't. For example, we just bought canned soda on sale for 20 cents a can. I can remember back when I first moved to the Seattle area and was downright giddy if I could get 6 cans (brand name) for a dollar (on sale). That was 20 years ago. No joke. So where's the inflation in Coca Cola products, assuming you are frugal and take advantage of the sales when they appear? I hope this helps. This is not investment advice. I am merely sharing thoughts on my investments with you. I own both TIPS and I-Bonds. I also have some money in TIP. I sleep better with the I-Bonds, but the government limits how much you can buy. I just keep right on buying every year though. That does not mean it is a good thing to do. 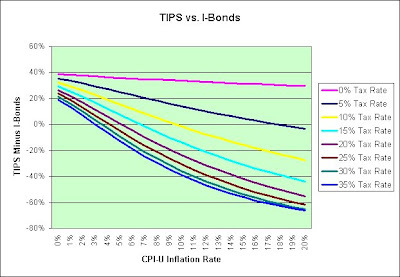 Should we hyperinflate, neither I-Bonds nor TIPS would protect you. Should we experience more productivity miracles, there would be far better places to invest the money. Nothing is easy. And lastly, my goals might be VERY different from your goals. I'd be perfectly happy just holding onto what I have and merely keep up with inflation from this point forward. I have very modest needs. Oct. 31 (Bloomberg) -- Nick Collins, an independent London real estate broker who's had record profits every year since 2003, took a hit in September -- and that may be bad news for a U.K. economy built on a housing bubble. Five of his 50 buyers pulled out of purchases, spooked by a run on mortgage lender Northern Rock Plc that left it 2 billion pounds ($4.1 billion) poorer. If only there was a way to measure people's confidence. Then we'd know for sure what's going on in the global markets. I'm confident we can just accelerate right through the Christmas season if we set our minds to it. Aren't you? Wages in China's cities have risen by almost 20 per cent since the start of the year, the government in Beijing said yesterday, adding to fears that the country's economy is overheating and might export inflation round the world. It's a good thing we don't import much stuff from China then. Whew! BEIJING, Oct 29 (Reuters) - China's worst diesel rationing in four years may last several more weeks as record oil prices choke output from independent refineries and the top suppliers show no rush to top up imports, industry officials said on Monday. I hope they don't resort to price fixing. That never works. China's independent plants, owned by local governments or private businesses, have either cut production deeply or halted operations altogether as they face losses from processing costly crude or fuel oil into products such as diesel and gasoline, the price of which is kept low by Beijing. I updated my last post with another chart so if you've already read it once you might wish to look again. Okay, here's the premise. Let's say you are somewhat rational. 1. You decide what you want your initial housing payment to be. I have chosen 50% of the average weekly wages reported by the BLS x 52 / 12. I figure with two people working these days in most households (generally), that seems rather doable. 2. You decide to take a 30 year conventional mortgage. 3. You decide what you can afford based on what your payments are going to be on the loan plus other direct expenses such as property taxes and insurance (in this case I have used 1.5%). That's the chart over time. As your wages went up, you could afford to pay more for the house. As interest rates fell, you could also afford to pay more for the house (this is a LOT of it). The bottom line is that you weren't paying more as a percent of your income, at least in this hypothetical (expected) chart. This is what it looks like when you adjust for inflation. 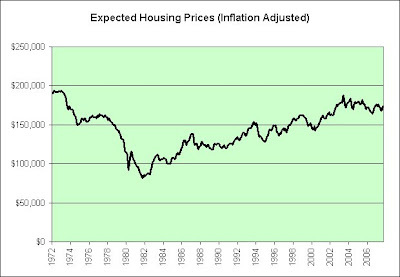 I'm not arguing that this is the actual inflation adjusted price of homes. I'm simply saying what I would expect to see as I look back in time knowing only the interest rate on the 30 year conventional mortgage over time. Is it rational to expect home prices to double in real terms over the last 20+ years? Yes and no I suppose, depending on how you look at it. If taken from the perspective we all seem to embrace that it is all about "what do you want your payments to be" then I would argue yes, it is rational. If you take it from the perspective of "how much do you want to pay overall" or "how much do you want to pay relative to how much it costs to make" then I would argue that no, it isn't rational. My parents bought their home in Spokane, WA in 1982. If anything, my parents home hasn't kept up with the first chart, although it is relatively close. My Renton, WA house was built in 1991 (I didn't own it then) and has appreciated pretty much right in line with the first chart. So that's the good news! Rising home prices aren't just an inflation story, in my opinion. It is much more an interest rate story. You know there will be bad news too though. Heaven help us all if interest rates rise. We will find out just how irrational planning our life around "what do you want your payments to be" was. The tailwinds from 20+ years of falling interest rates would turn into some rather nasty headwinds. What could cause that? Oh, I don't know, a reluctance to loan people money with a 30 year contract when oil is pushing $90 a barrel and many are finding it hard to pay? Just a thought. In any event, this does not imply that there hasn't been a great deal of speculation involved in select pockets (or perhaps even entire states) of this country. It also doesn't imply houses are fairly valued. To know that we'd need to know more about future wage growth and future interest rates. I'm not that hopeful on the former and I'm somewhat fearful of the latter (in the long-term). 20+ years of tailwinds are not something we can continue to count on more than likely. Maybe we better stop acting like we can. Even lower interest rates aren't going to help all that much. The reason? As interest rates fall, property taxes (about 1%), principal repayment, and the premium/profits to the ones making the loans (about 2%) are taking up a larger and larger part of the overall housing payment. There just isn't all that much left to be milked by lowering interest rates further, at least in the grand scheme of things anyway. At 2% conventional mortgage rates (probably the bare minimum if Japan is any indicator), the inflation adjusted chart would peak at $260k and would put enormous risk on home prices should interest rates rise in the future. This chart shows where the wages allocated to the house purchase would initially go (as seen in the hypothetical charts at the top of this post). I'm also more comfortable that I did the math right in the other two charts because the numbers added up (+/- $20 in rounding error each month due to the $2k rounding I did in expected home prices) when I reengineered the reverse engineering. This is a look at the chart I did in my last post compared to the 10 year treasury yield (treasury yield is upside down to show the possible inverse relationship). We might not expect to see that much correlation during periods of rising interest rates simply because people do not have to refinance a fixed rate mortgage when rates are rising. When rates are falling, they will of course take advantage of it. That might explain why the left side of the chart is less correlated than the right side (that and the 1970s were a hard asset decade thanks to inflation and negative real rates of return). 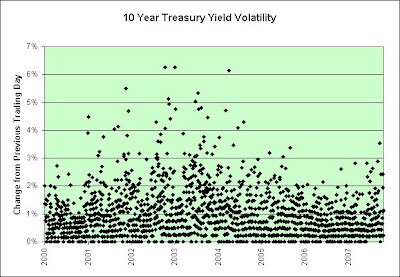 Could the lack of correlation recently have anything to do with giving loans to anyone with a pulse, no documentation loans, interest only loans, negative amortization loans, commercials showing renters flushing money down toilets, a plethora of real estate TV shows, the assumption that home prices only go up, and so on, and so on? Who knows! It is possible this is just a coincidence as well, but it does back my thinking that falling interest rates for 20+ years led to all sorts of unsustainable prosperity and we're more than likely overdue for some headwinds. I previously posted a chart of the housing units that were "for sale only" (and I updated that chart with a more appropriate title). That's what you generally see when a real estate agent shows you an empty house and you decide if you want it or not. Let's just say you wouldn't expect to see a renter there while you are taking the tour. It turns out that the "for rent" section of the data also includes housing units for sale (housing units that people are trying to rent and/or sell). So the above chart shows that. This does not include the housing units that are "for sale only" though. Dizzying, huh? 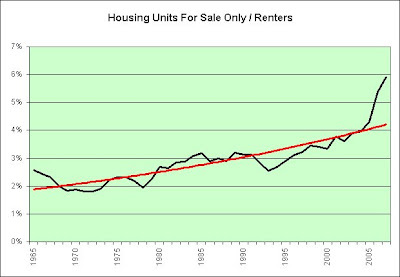 And finally, this chart shows all the housing units that are for sale only or are for sale or for rent. The data would be so much cleaner, in my opinion, if the categories were "for sale", "for rent", and "for sale or rent", but hey, maybe that's just me. In any event, this chart shows all housing units that are for rent or for sale (and therefore vacant awaiting new occupants). Let's start with the obvious again. There are exponential trend lines on these charts and there really shouldn't be. There's no way this can go to 100% someday unless financial Armageddon has struck. Here's a scary thought. These last charts start their climb up when interest rates peaked in 1980. Oh how we have embraced those declining interest rate tailwinds! 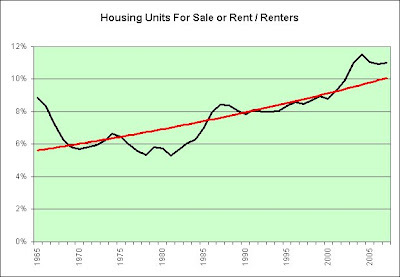 The last chart is probably the most noteworthy, since it represents all of the choices a renter could make. Right now the typical renter can make a LOT of choices. Perhaps too many. Perhaps 6% too many. 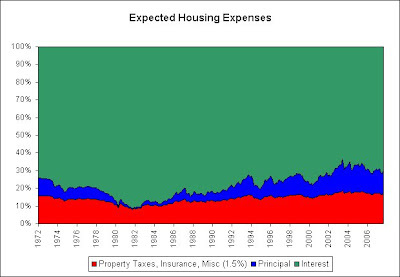 From 1965 to 1995, using the eyeball, 10% looked to be a good equilibrium point between renters and choices. So you are probably asking yourself what 6% means in that chart. Well, the math would imply we've got about 2.4 million vacant housing units too many or we're short about 24 million renting households (or some combination of the two). Let's assume this is true for a moment. What can we do to fix the problem? 1. Not much will get rid of 2.4 million extra housing units except population growth, the forces of nature, or the desire of households to divide and conquer. If an entire renter household decides to buy a housing unit to solve the problem, an empty rental unit is left in his wake. Nothing changes. The previous landlord now has a problem. How's that for dire? Okay, what if we just live with the problem? Economics 101 says that if you've got way too much of something, say housing units, and the demand drops (say out of fear, a credit crunch, speculators running for the hills, and/or affordability issues) then the price must eventually come way down. That seems to be the solution and I see very little to stop it, well, other than a monetary printing press working overtime to make it appear that the price didn't come down all that much. Unfortunately, the monetary printing press doesn't just target housing units. It also pushes up the price of other things too. Oh well! Pure green shows a Gini coefficient of 0.40. Pure yellow shows a Gini coefficient of 0.45. Pure red shows a Gini coefficient of 0.50. The higher the coefficient, the greater the income inequality. District of Columbia comes in at a whopping 0.537 (off my scale, not shown). MADRID, Spain: Spain plans to restore a fifth of its coastline from overdeveloped concrete jungle to a more natural state by enforcing legislation to demolish illegal construction, officials said Monday. Too much inventory? No problem! Construction and related industries make up 18 percent of Spain's economy, which has posted 14 straight years of growth. Fortunately, the deconstruction business can keep that trend alive. The primary goal is to sell homes to renters. Right? So let's do it. Let's treat them like an infinite resource. 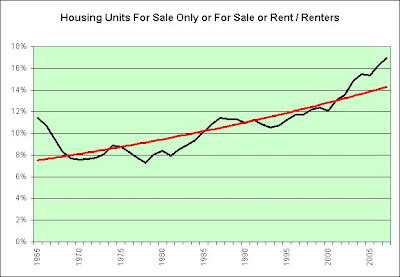 No such thing as peak renters in our world. That being said, let's start with a dwindling supply of renters to buy homes (renters shown as a percent of renters plus owners). D'oh! Add homes, lots and lots of homes (literally!). 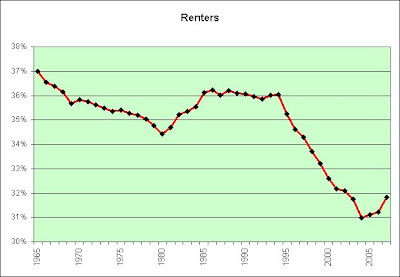 Simultaneously simulate a 1990-1991 style consumer recession in the Renters chart action (from 2004 to 2007 in the above chart). D'oh! Beat to a pulp with your favorite exotic mortgage cooking instrument. D'oh! Bake for several years and enjoy! Just don't let it cool. Never let it cool. You'll just have to trust me. That would be VERY bad. Note that I put an exponential trend line on that bottom chart. There's only two problems with that. First, it doesn't make any sense for it to be exponential. That would imply that there will be one housing unit for sale per renter someday. Second, it is behaving much more like a parabolic chart. That's actually much worse. D'oh! So here's another way to look at the data. In 1965, the percentage was 2.58%. In 1993, the percentage was 2.54%. Maybe something around 2% to 3% might be kind of normal. If so, what the heck are we doing up here near 6%? Nah, that's just crazy talk. Real estate only goes up. That's what we are told, over and over and over again (mostly through TV shows such as House Hunters, Designed to Sell, Location, Location, Location, Buy Me, Property Ladder, Sell This House, Flip This House, and Flip That House). 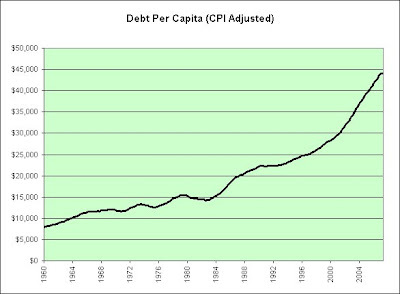 The data in the two charts is yearly from 1965 to 2006. 2007's data is from 2007 Q3 as released on October 26, 2007. 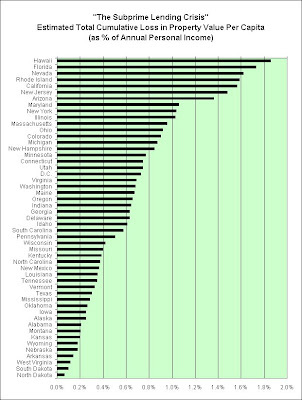 This shows the personal income per capita per state. The average is $37,742 per capita. The standard deviation is $6,304. Pure green is two standard deviations above the average. Pure yellow is the average. Pure red is two standard deviations below the average. 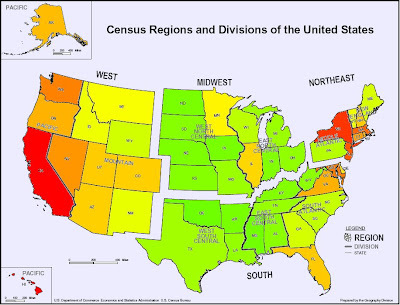 D.C. tops the list at 3.63 standard deviations above the average (not shown), followed by Connecticut at 2.55, Massachussets at 1.77, New Jersey at 1.76, New York at 1.49, Maryland at 1.32, Virginia at 0.63, Colorado at 0.63, Nevada at 0.61, New Hampshire at 0.59, and California at 0.59. Generally, personal income and home prices are clearly linked. However, one has to wonder how California can justify its lofty prices. I do think Rob Dawg makes a good point that "Proposition 13 has created a market of slower turnover in many places." A large contributor to Proposition 13 was the sentiment that older Californians should not be priced out of their homes through high taxes. Behold the power of unintended consequences. Now the younger Californians are being priced out. It brings me back to the point of this blog. We can't all get something for nothing. Eventually somebody must pay. This post inspired by russell120's comments involving personal incomes and Rob Dawg's comments involving Proposition 13. The sneakers I have bought at Costco for umpteen years (non-scientific description) have finally moved from $14.99 a pair to $15.49 a pair (3.3% increase). Based on this purely anecdotal evidence, the chart of the US dollar vs. the Canadian dollar, and the stubbornly high price of gasoline, I'm altering my short-term inflation mood somewhat higher in response. It is still somewhat negative based on the housing and unemployment situation. However, I would strongly urge others to not base their investment decisions on the short-term "mood" of a random anonymous Internet blogger. Hopefully that goes without saying though! This is an update to a map I did previously and attempts to compensate for Hawaii and California skewing the national picture so much. The average subprime home value of the states: $213,377. Pure red represents two standard deviations above the average. Pure yellow represents the average. Pure green represents two standard deviations below the average. Hawaii is off the chart coming in at 3.45 standard deviations above the average. California is too, coming in at 2.55 standard deviations above the average. (I'd need an even brighter red to do them justice.) New York is next, coming in at 1.59 standard deviations above the average. This chart shows the estimated number of subprime loans outstanding divided by that state's population. Nevada tops the list at 5.39% (and is shown as pure red). In other words, 5.39% of the population has a subprime mortgage loan apparently. That's fairly impressive if you keep in mind that a typical family would generally only need one at most. 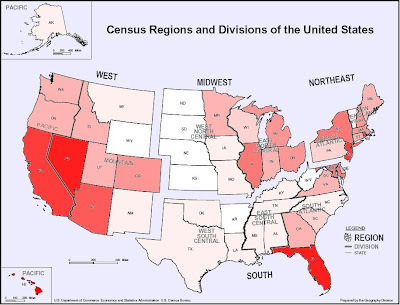 Next comes Arizona (4.07%), Florida (3.91%), Colorado (3.36%), Maryland (3.0%), Utah (2.90%), and California (2.83%). This shows the unemployment trend from March, 2007 (the low in national unemployment) to September, 2007. Pure red indicates unemployment increased by 1%. Pure yellow represents no change. Pure green indicates unemployment dropped by 1%. First, the good news. Arizona's unemployment dropped from 3.9% to 3.3%. Idaho and Mississippi are also showing good trends. 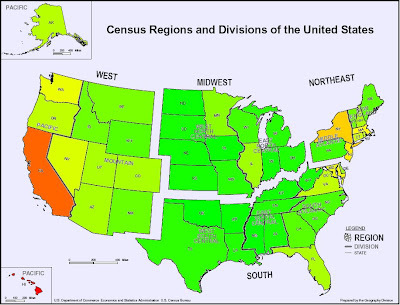 Any state in the yellow to green part of the color spectrum is doing okay (at least as far as the trend goes). Unemployment is holding steady in Texas (and Texas has a large population). Hawaii is doing well, which might help support its lofty real estate market. Now the bad news. 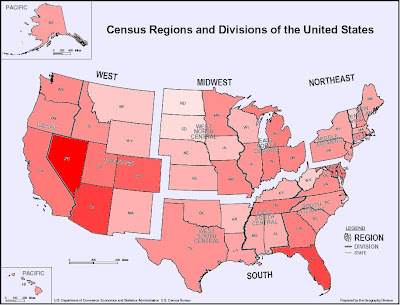 Roughly 1/8th of the population lives in California, which saw its unemployment increase from 4.8% to 5.6%. This doesn't bode well for its housing market. Any state in the orange to red part of the color spectrum isn't doing all that well lately (at least as far as the trend goes). Michigan saw its unemployment rise the most, from 6.5% to 7.5%. SUNNYSIDE, Wash. (AP) - Fans of Snipes Mountain Brewery's cloudy Hefeweizen relish the subtle wheat flavor of the bright, summery brew, and like beer drinkers everywhere, they know when their favorite brew tastes a little too hoppy or bitter. I'll leave the rest as an exercise for the reader. Kevin left this article for me in the comments. He's outdone himself this time. I lived in Sunnyside, WA until the age of six. No kidding. I spent some time reworking and cleaning up these most recent posts from the JEC report, so if you've already read them once you might wish to glance over them again. This shows the average "subprime" home values as seen in the JEC report. 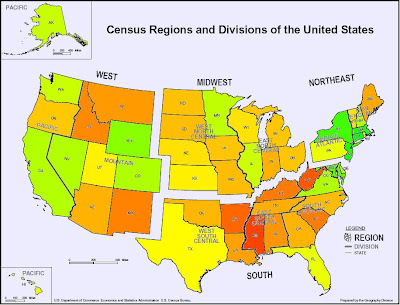 I've colored each state using a smooth scale from green (inexpensive) to lime green (fairly inexpensive) to yellow (mid priced) to orange (high priced) to red (most expensive). Note Hawaii in the lower left corner. Apparently that average $529,346 is based on subprime loans. Go figure. 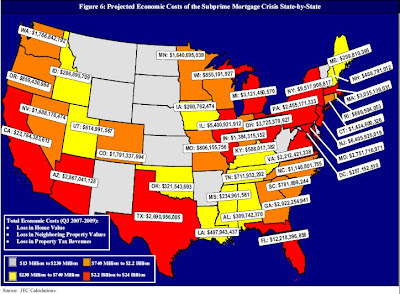 This is the map version of the data shown in "The Subprime Lending Crisis" v.2 based on the data I extracted from the JEC report and adjusting for populations and personal income. This is the Joint Economic Committee's crisis map. You'll note that Texas is in bright red. Texas has just 1/9th of the subprime problems California has (by total dollar amount) but just one third fewer people. Texas is not even remotely the epicenter of this crisis, in my opinion. 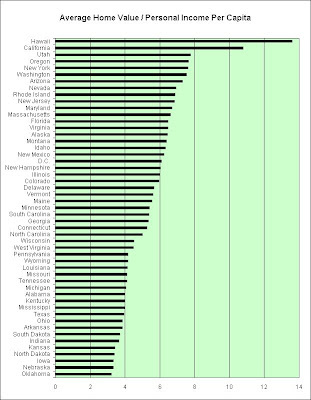 This chart shows the average "subprime" home value per state divided by the personal income for that state (per capita). But foreclosures, although running ahead of last year's level, have a limited footprint in the islands, and buyers and developers are getting loans. "Speculation was not as prevalent in Hawaii," said Jon Whittington, a senior vice president with Countrywide Home Loans. Whew! Countrywide Home Loans tells us everything is okay. I'm sure they are objective. Countrywide is Hawaii's and the nation's biggest residential lender. "Unprecedented times call for unprecedented remedies. We are determined to assist borrowers who have the willingness and wherewithal to remain in their homes, but need a little help to do it," Countrywide president and chief operating officer David Sambol said in a statement. The report also noted that Topa Financial Center has nearly 10,000 square feet pending vacancy from Countrywide Home Loans Inc., BNC Mortgage LLC and a small brokerage firm. Maybe Countrywide needs to offer Countrywide an incentive to stay. For one Honolulu homebuyer, loan terms abruptly revised last month demanded the borrower come up with $120,000 cash — double the $60,000 already committed as a down payment to purchase a $600,000 Downtown condominium. Abe Lee Realty agent Jonathan Ford, representing the buyer, who did not give permission to be named, said his client was in escrow to buy the condo until lender Countrywide Home Loans withdrew terms for a loan the company earlier preapproved. Ford said Countrywide, the largest residential lender in Hawai’i, needed either the extra $60,000 from his client or a $40,000 price reduction from the seller. But Countrywide, Ford said, refused to budge only eight days before the sale’s closing deadline. “I thought (my client was) going to lose this home,” he said. Unprecedented times call for unprecedented remedies. That's what I'm told. 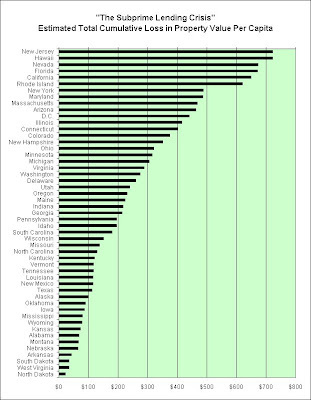 I have taken the data in the report (below) and adjusted it by the population and personal income of each state to once again show the states which are/were most affected by this "lending crisis." I think we owe the Dakotas a round of applause for managing to avoid most of this mess. Sorry Hawaii! You appear to be the winner. I have taken the data in the report (below) and adjusted it by the population of each state to more accurately show, in my opinion, the states which are/were most affected by this "lending crisis." Let's say the government offered me unlimited 0% interest loans and required no collateral (which isn't all that far off the mark if one looks at 2004's interest rates and mortgage offers). What would I do? I'm financially conservative and as you can probably guess I'm somewhat bearish. However, I'd borrow as MUCH as I possibly could. At the very least I could simply borrow it and bury it. There'd be no risk. I could always just use it to pay off the loan. However, I doubt I'd do that, especially if I saw other people spending their generous loan money from the government. I'd start to think my buried money would soon not be buying as much (think oil). Let's say they'd offer me a $1 trillion 10 year loan. That means I'd have to pay back $100 billion a year. For five years let's say I spend $100 billion of it and make the loan payments using the other half. At the end of five years I'm completely out of money, but man, I sure helped the economy out during the period, didn't I? So now what? I inform the government behind closed doors that this consumer, me, is complelely tapped out. They have the choice of a deflationary collapse or a helicopter drop to rescue me. I'm not asking for much. I simply want a $2 trillion 10 year loan under the same terms and I'll be okay. They agree. We all know they can't tolerate serious deflation. Now I owe $300 billion per year for the next five years and $200 billion per year over the following five years. No problem! I've got $2 trillion. I'll continue spending $100 billion a year on fun and pay $300 billion per year on my loans. At the end of five years I'm completely out of money again. So now what? I inform the government behind closed doors that this consumer, me, is completely tapped out again. They have the choice of a deflationary collapse or yet another helicopter drop to rescue me. I'm not asking for much. I simply want a $3 trillion 10 year loan under the same terms and I'll be okay. Now I owe $500 billion per year for the next five years and $300 billion per year over the following five years. No problem! I've got $3 trillion. I'll continue spending $100 billion a year on fun and pay $500 billion per year on my loans. At the end of five years I'm completely out of money again. It is the Halloween season! Scary, huh? This is why I have a hard time being a deflationist (at least in the long-term). Of course, it could be argued that $100 billion a year is eventually going to be inflated away. That's no problem! I'll simply mention that to the government and ask to borrow even more money to compensate! At zero percent interest, clearly I can afford as much as they're willing to lend me. Hurray! That being said, just where are the low interest rate loans these days? I listed some banks' default rates last year -- American Express (NYSE: AXP) was charging 28%, for example, and Capital One (NYSE: COF) was charging 27% -- and it seems that some have risen even higher. JPMorgan Chase, for example, seems to have hiked its universal default rate from 30% to 32%. Imagine paying 32% per year on your debt -- that would cost you $1,600 on a $5,000 debt -- just in interest. According to the results of a recent survey many consumers in the UK are having to turn to costly credit cards in order to make some of their mortgage repayments, with many finding it increasingly difficult to keep up with repayments based solely on their income. "There are people out there who have technically bought a house on a credit card and they've done very well. I bought my first property off the back of credit cards and the credit cards were a hell of a lot less than a mortgage." A recent study by CreditExpert.co.uk found that the vast majority of homeowners in the UK were unaware what the impact of rising interest rates would be on their mortgage repayments. Yeah, I'm still bearish. Go figure. This chart shows the absolute change in the ten year treasury note from one trading day to the next. 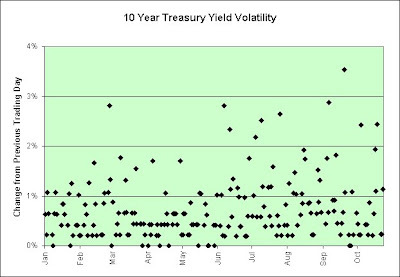 Investors seem very unsure of the 10 year rate picture. I certainly am (especially since I'm worried about inflation). Note that interest rates in the early 1960s were roughly the same as they are right now. 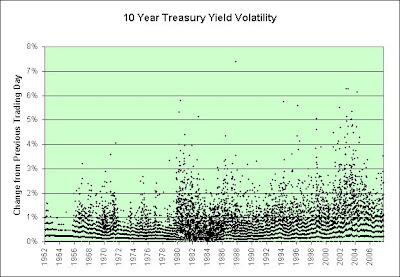 However, the volatility in the 10 year interest rates is much higher these days than back then. That high point in the volatility in 1987 coincides with the stock market crash. 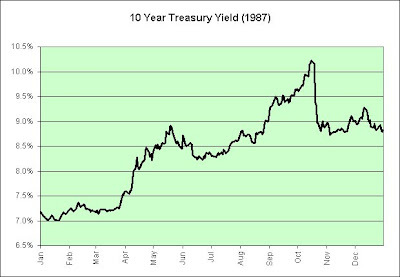 Here's 1987's 10 year treasury yields. It is fairly obvious why the stock market would crash under the following circumstances. Ouch. Needless to say, I'm not exactly expecting a 1987 style crash in the morning. On the other hand, if/when we do someday get a crash I'm not expecting a 1987 style recovery after it either though. Here's a closer look at the past few years. The shaded areas show economic contractions. This is yet another tailwind (in addition to interest rates falling the price of oil wasn't even keeping up with inflation) we had heading into the year 2000. Now we seem to be in headwind mode. This shows the change in price from one trading day to the next. 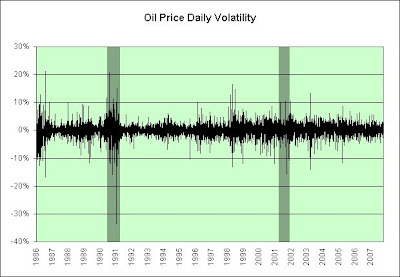 I expected that there might be more volatility recently as oil moved substantially higher. However, that was not the case. I'm not sure what to make of it. I offer it mostly as trivia. Is it the calm before a storm? Is it the storm? No idea. So-called "peak oil" is coming, but it doesn't have to be a disaster, Chevron Chief Technology Officer Don Paul said Wednesday. Pickens said the major oil companies should be doubling dividends and cutting buybacks. The companies will be manufacturing operations eventually, he said. ``The reserves will be gone and they're going to be refiners and processors,'' Pickens said. I can't help but think of Capital One Financial's buybacks. I also appreciate that Capital One has been buying shares back hand over fist, completing a whopping $2.2 billion of buybacks year to date. It's nice, as a potential shareholder, to see management rewarding investors when it thinks its shares are undervalued. That's all fine and dandy, but the buyback was actually announced on January 25, 2007. The price of the stock then was about $80 a share. It is now $64, which is actually lower than when I turned bearish on our economy back in the fall of 2004. Most of the buybacks are seemingly done and what do they have to show for it? Just imagine what the Canadian investors are thinking (if it was priced in Canadian dollars). Now they are going to try the Pickens plan. Analysts say the move by McLean-based Capital One puts the financial services company closer to others in the banking industry. Currently, Capital One's dividend payments are in the range of 2 to 3 percent of earnings. Slower growth here we come apparently. It's official. This is the worst year ever for layoffs in the U.S. financial-services industry—and there's still more than two months to go. Maybe when finance companies start buying back their people in addition to their stocks I'll turn a bit more optimistic. I'm not holding my breath though. Then again, it has been quite a few years of subprime performance (pun intended). It isn't like I'm going to be shorting the stock (and therefore risk shorting inflation). These are just my opinions of course. I might be commenting on the casino but I'm trying not to play in it. Chicago might not be a 24-hour city, but its strengths will help it withstand the punches that commercial real estate markets nationwide are expected to suffer in the coming year, according to a recent report from the Urban Land Institute and PricewaterhouseCoopers LLP. Real estate developers and investors expect property values across the country to be restated, and risk to continue to be repriced, with those who have relied most heavily on debt to sustain the harshest economic blows. Although 78 percent of respondents interviewed for the report expect even tighter underwriting criteria for financing in 2008, they also predict that real estate will outperform U.S. stock and bond returns next year. I think I need to look up the definition of suffer and find something worse to describe next year's U.S. stock and bond markets then, assuming we can trust this report. 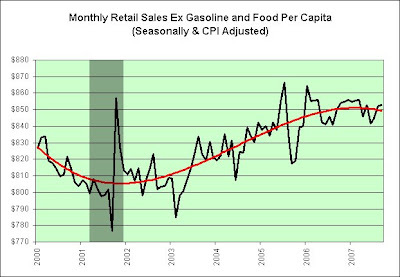 This is a closeup look of my last chart showing retail sales excluding gasoline stations, food and beverage stores, and food service and drinking places. The trendline is a 4th order polynomial, and represents just one possible look at the trend out of many. Update: There was an error in my CPI adjustment for gasoline (I wasn't adjusting it!) and it has been fixed. Sorry about that. The conclusions remain the same though. This shows the Retail and Food Servies, total sales, the Retail and Food Servies, total minus Gasoline Stations sales, and the Retail and Food Servies, total sales minus Gasoline Stations sales, Food and Beverage Stores sales, and Food and Drinking Places sales. The government tells us it is often easier to see what's really going on if we exclude volatile food and energy. I actually believe that. Just look at the blue line. Do you feel more prosperous? I certainly don't feel more prosperous putting $3 gasoline in my car than when I was putting $1 gasoline in my car. It is all the same fluid to me. If 1992 to 2000 marks a prosperous era, what does 2000 to present represent? More specifically, what does 2005 to present represent? I would argue stagflation. Update 2: I spotted the following while attempting to answer a question left for me in the comments. Residential heating oil prices rose dramatically over the period ending October 22, 2007. The average residential heating oil price gained 7.4 cents last week to reach 286.8 cents per gallon, an increase of 48.3 cents from this time last year. Up 20.2% year over year. The average residential propane price climbed by 5.5 cents to arrive at 220.8 cents per gallon. This was an increase of 27.4 cents compared to the 193.4 cents per gallon average for this same time last year. Up 16.5% year over year. The U.S. average retail price for regular gasoline surged 6.1 cents last week to settle at 282.3 cents per gallon as of October 22, 2007, which is 61.5 cents higher than last year. Up 27.9% year over year. Retail diesel prices grew 5.5 cents last week to 309.4 cents per gallon, 57.0 cents per gallon more than last year, and the highest price since October 24, 2005. Up 22.6% year over year. Oct. 24 (Bloomberg) -- Crude oil fell in New York to below $85 a barrel on expectations that a U.S. government report today will show an increase in oil and gasoline stockpiles. Crude oil supplies fell 5.29 million barrels to 316.6 million barrels last week, the report showed. The drop left stockpiles the lowest since the week ended Jan. 5. A gain of 963,000 barrels was expected, according to the median of 16 responses in a Bloomberg News survey. Stagflation until something breaks, and if we're really lucky, more stagflation even then! Woohoo! One day after besting analysts' expectations for the third quarter, shares in Amazon.com Inc. slid nearly 12 percent as analysts worry about the online retailing giant's future. Now they are worried about the future? Oh oh, somebody is looking out the front window again. The shaded areas represent economic contractions. The black line shows the civilians who are working as a percent of the Civilian Noninstitutional Population. (The civilian population excluding persons residing in institutions. Such institutions consist primarily of nursing homes, prisons, jails, mental hospitals, and juvenile correctional facilities.) Note that the black line has been clearly trending down in recent months. 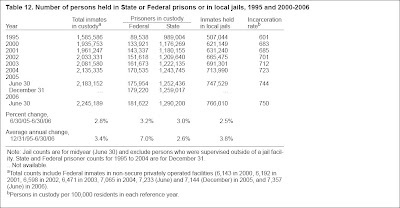 People in jail are not considered unemployed nor are they considered to be part of the civilian workforce (and are therefore not included in the chart above). If you think of "doing time" as a job, it certainly has been a growth industry (growing much faster than the population). I suppose the moral of the story is that if we were a nation made up entirely of criminals (shame on us), there would be no employment or unemployment. Go figure. Note that the Civilian Noninstitutional Population data is not seasonally adjusted unlike the rest of the data. Also, a few of the series have a "break in the data" in January, 2000. I think it is good enough for my purposes here though. 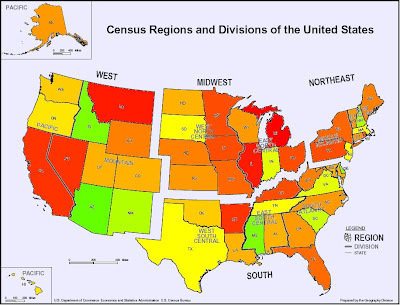 The Bureau of Labor Statistics (BLS) announced several revisions to the Household Survey on Friday Feb.7th 2003, with the release of the January 2003 Data. 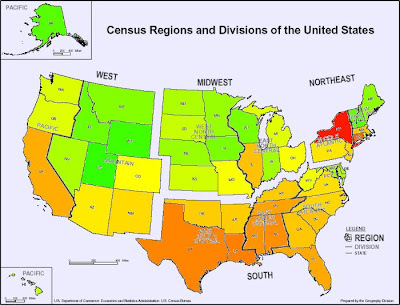 They introduced the Census 2000 population controls (which affect data back to 2000 and cause a break in the data in January 2000), a new seasonal adjustment procedure, and new seasonal factors back to January 1998. This chart seems to be winning the battle so far. 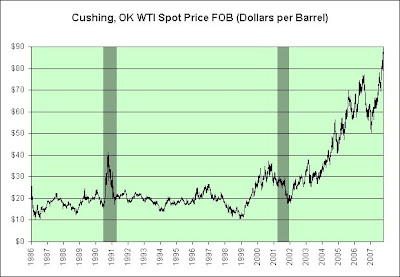 However, with oil at $80 and gold at $700+ there's at least a chance this chart may show our future. It sure would be nice to know for sure, wouldn't it? I'm serious. I am torn between the two charts and they do not agree with each other. 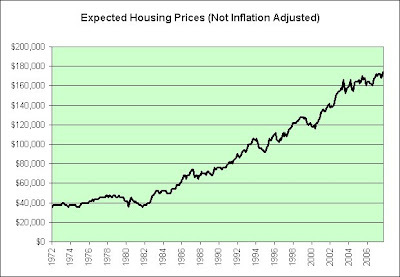 If interest rates only come down because housing is in trouble and not because inflation is under control, I'd be tempted to cringe while looking at the latter chart. For the record, I'm tempted to cringe. I continue to be deflationary in the short-term and inflationary in the long-term. Here's the first thing we know. The household credit market debt outstanding has been rising at an alarming rate for many years, even when adjusted for inflation and the growing population. One might say it even looks a bit parabolic. Here's the second thing we know. 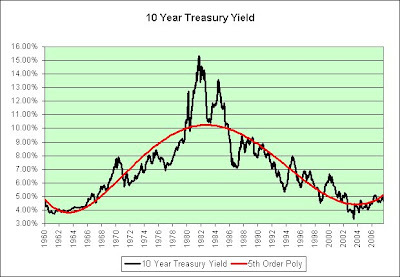 For the last 20+ years interest rates have been falling and have given us one heck of a tailwind. 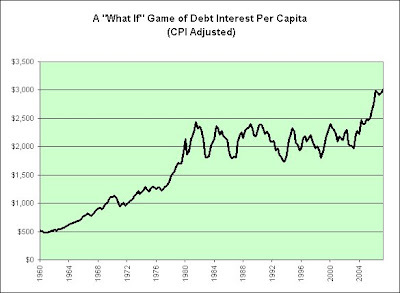 So let's do a ballpark estimate chart to see what the annual interest payment would be on all that debt above if it was continually refinanced at the 10 year treasury rate plus 2% (so banks can make lots of money off of our borrowing). Let's call 1980 to 2004 the "what do you want your payment to be" era. Anyone who has ever bought a car knows what I'm talking about. Interest rates were falling. It seems likely that consumers simply borrowed more to enjoy the ride. As can be seen in this "what if" experiment, it was a virtually pain free thing to do. Let's call 2004 to present the "how do I keep my payments small" era. Anyone who has bought a house using an interest only adjustable rate mortgage with a low teaser rate knows what I'm talking about. Interest rates were rising. It seems likely that consumers didn't want to stop doing what seemed to work so well for 20+ years. In any event, it seems likely that something changed in 2004. That's the year I turned a bearish on our economy. That's when I first started thinking in terms of stagflation: gold and silver (not that I own those metals now, for what it is worth). That's not a very pretty picture of real wages, especially since unemployment is now starting to rise off record lows, again. Okay, I tried to pack some information in this chart. The shaded areas represent economic contractions (recessions). The red line shows the unemployment rate (right scale). It is upside down to show a strong inverse correlation to wages. The black line shows wages (just those reported by the BLS) per capita (left scale, hourly earnings x weekly hours x 52 x civilian employment / population, and adjusted by the CPI). 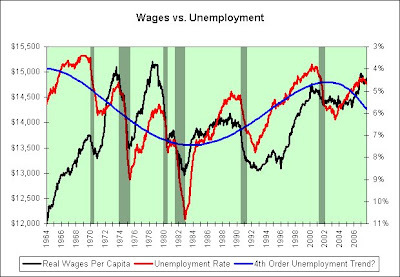 The blue line is a 4th order polynomial attempting to make sense of the unemployment trend (just one interpretation, which could clearly be wrong, see Trend Line Disclaimer). 1. If unemployment increases it will create two effects. First, real wages per capita will fall because the percentage of people working will fall. Second, real wages per capita will fall because the average hourly earnings will eventually fall. Companies won't feel so pressured to pay as much if there are more job applicants. 2. 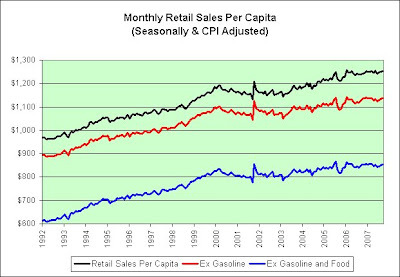 Real wages per capita is what is keeping the consumer alive. Therefore, we really don't want to see unemployment rise. 3. We are at near record unemployment and have a housing slump. Therefore, the odds of unemployment going down from here are probably not nearly as high as the odds of unemployment rising from here. 4. Unemployment has increased and some think it will continue to increase. I do. 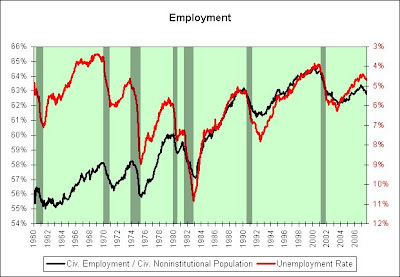 When one looks at the chart there are a few instances when unemployment increases by a trivial amount and then it reverses. However, there are also plenty of examples showing that once the corner is turned it rose quite rapidly. 5. Since at least 1964, every instance of a non-trivial rise in unemployment marked the start of a recession. Every single one. No exceptions. We are still at the trivial level. We better hope we stay there. 6. 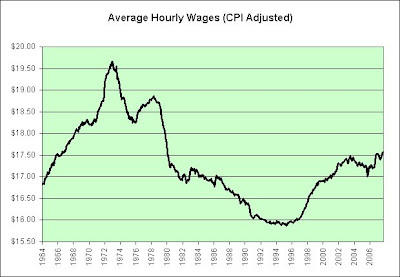 We are at near record wages per capita (adjusted by the CPI). The odds of real wages per capita rising from here seem lower to me than the odds of real wages per capita falling from here. As seen in the chart, there is a relatively strong relationship between unemployment and real wages per capita. Unemployment isn't falling any longer. 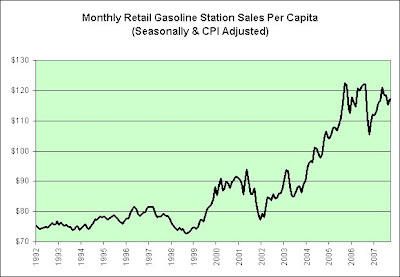 It was 4.4% in October, 2006. It is now 4.7%. 7. Note the rise in real wages per capita heading into the stagflationary 1970s. Now note the rise in real wages per capita heading into 2000. Is it a coincidence that oil, gold, and silver have done well? 8. And lastly, we have plenty of reasons to be fundamentally concerned about the job market. Housing is weak. The consumer is showing stress. The Fed would no doubt love to lower rates more to help both out. There are a few problems though. The dollar is very weak and oil is $80+. They offer too much help and things will really fall apart. Further, it takes time for the help to arrive. Maybe too much time. Of course, these are just my opinions. I'm deflationary in the short-term and inflationary in the long-term. How confident am I? Not very. I'm just sitting on the sidelines (with inflation protection for the long-term). I don't like betting against inflation. There's no limit to how much you can lose if you bet against monetary printing presses. In a recorded message, the retailer said its reduced forecast was partly based on "greater-than-normal daily volatility and continued disappointing sales results for the first two weeks of October." Sales Manager: Why aren't you buying? Customer: I came in here yesterday. Sales Manager: Our records show you did. Customer: Don't I normally come in on Fridays? Sales Manager: Yeah. We were concerned about you. Customer: I think I'll spend an extra hour in here on Thursday. Sales Manager: Can we expect to see you on Friday? Customer: I've already said too much as it is! Customer then runs out of the store in a blind panic while looking over his shoulder in a most paranoid way! This greater-than-normal daily volatility excuse better not catch on. You can bet that if it works for a retailer, with presumably fairly stable pricing, just imagine what it would do to a stock market! As in the past, employment opportunities for retail salespersons are expected to be good because of the need to replace the large number of workers who transfer to other occupations or leave the labor force each year. In addition, many new jobs will be created for retail salespersons as businesses seek to expand operations and enhance customer service. 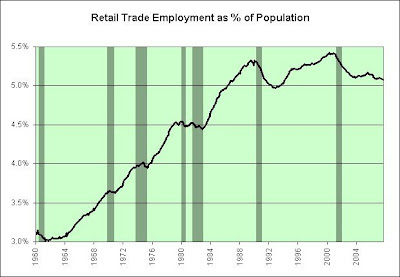 Employment is expected to grow about as fast as average for all occupations through the year 2014, reflecting rising retail sales stemming from a growing population. That's certainly some good news. I sure hope the "as in the past" model continues to work. 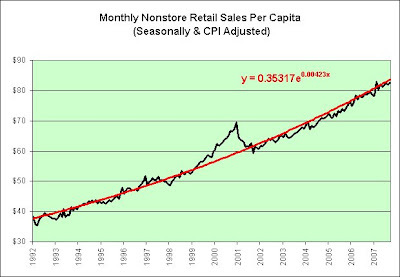 Perhaps nonstore retail sales growth explains some of that. That's an inflation-adjusted 5.2% annual growth (0.423% per month) per person. It is starting to get quite the appetite. It might be a productivity miracle, but it isn't an employment miracle. Further, I wouldn't want to be a brick and mortar forced to compete with it (and those like it) right now. It is sneaking up on the brick and mortars just like globalization snuck up on Detroit, not that I'd pay 125 times earnings for any retailer heading into a possible consumer recession, but hey, maybe that's just me. As a side note, just how are Detroit's consumers holding up these days? Bill Ackman, whose hedge fund Pershing Square recently bought 5 million shares, has calculated that the Sears' U.S. retail real estate at just $8.5 billion of its total $20 billion enterprise value, Barron's said. Better extract that value soon. The clock's ticking. Real estate is in a slump and the Internet continues to grow exponentially, just like clockwork. The shaded area represents our last economic contraction. Our last consumer recession was July, 1990 to March, 1991. This data doesn't go back that far. Here is some data covering our last consumer recession. 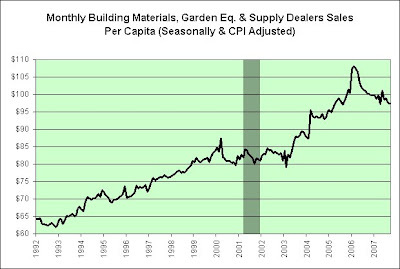 Please note the large drop off in per capita sales of building materials during that period (the numbers are not adjusted for inflation, or they'd look even worse). So here's the question of the day. Just how bad is the aftermath of our current housing bubble going to be? Are we going to slowly slide down and muddle our way through this or are we going to panic at some point? There are a number of things that could keep us awake at night, and several of these are in the realm of economics. Obviously not all is well in the economy. Despite all the bad news, let me assure you that the American economy is not going down the tubes. It remains the largest and most important economy in the world, ahead of Japan, Germany and China. The economy will continue to expand modestly in 2007, and most analysts say they believe that it will not go into a recession despite the serious challenges it faces. I don't know about you, but when I'm told not to panic I tend to calmly move towards the exits. Further, you've got to love the wording on what the analysts are saying. He had a choice. He could have said most analysts believe. Instead, he chose to say most analysts say they believe. Why do you suppose that is? The distinction is rather subtle. As one who believes that most analysts have a vested interest in saying one thing while thinking another, I'm rather skeptical of what analysts have to say. However, I'd love to know what they really think. What were most analysts saying at the height of the dotcom bubble? What were they actually thinking? Here's a look. Note the difference between the "public assessment" and the "internal assessment." So please forgive me if I don't jump up and down with excitement over what the analysts have to say. Like any good ponzi scheme, the first to sell have the most to gain. I have to admit it does sound like one of the better pension schemes, at least for them. Research by Hometrack, the property data company, has revealed how wide the discrepancy can be: selling a three-bedroom house and buying a two-bedroom flat in the Royal Borough of Kensington and Chelsea, for example, would typically release more than £1m of equity. That's a lot of retirement cheeseburgers. Most of us are not big fans of insurance companies right now, so having the security of a "paid-off home to sell during our golden years" is a very attractive goal. When are the golden years coming? Maybe when some of the baby boomers start to retire? Let's not worry about that though. Let's distract ourselves with this hit released in 1975 instead. We were just coming out of a rather nasty recession but don't let that bother you. Run for the shadows, run for the shadows, run for the shadows in these golden years. ST. LOUIS (Reuters) - Federal Reserve Bank of St. Louis President William Poole said on Friday that interest rates are about right and if the Fed decides to cut again, it ought be confident it will not have to quickly reverse course. "I think that, given the information set that we have, we are approximately in the right place," Poole, a voting member of the Fed's interest rate setting committee this year, told Reuters in an interview. The next meeting is on October 30-31. "If I thought that we were way off the right place, what evidence would I offer? Well, I think the market would be looking at the same thing that I'm looking at, and then we wouldn't be there, we'd be in a different place," he said. Ever get the feeling we're just running in place? Yeah, me too. Thanks to kwark for bringing this one to my attention! 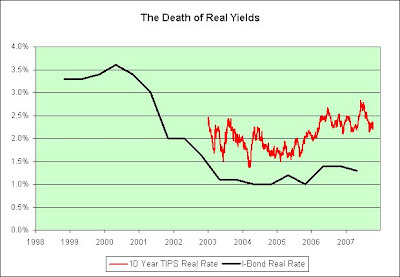 If the economy is so strong and healthy then why haven't higher real yields returned? The 10 Year TIPS were yielding in excess of 3.5% before the dotcom bubble burst (not shown in the chart due to lack of data). That the Fed says it is puzzled by this phenonema means of course that they are trying to absolve themselves from any guilt for the low yields and the problems they create. But as we shall see, the Fed is guilty just as it was guilty of fueling "the irrational exuberance" of the tech stock bubble. Here's a thought. Real yields were actually negative in the 1970s as the price of oil and gold rose. Some conundrum, huh? For many investors the high level of debt in U.S. households makes it unlikely that the Fed would dare increase interest rates even more. Similarly, the sluggish growth and/or high debt burden in other rich countries have also increased expectations of continued low short-term interest rates there. 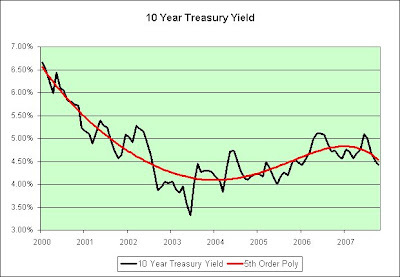 Of course, to the extent that low bond yields are a result of expectations of money supply increases rather than actual increases it will not cause a lowering of the overall cost of capital, but will mean a shift in investments from stocks and by extension business investments to fixed-income securities and by extension housing construction. Here's the list of fastest growing imports for August (over July, ranked by dollar amount of increase). Here's the list of fastest growing exports for August (over July, ranked by dollar amount of increase). Gold and food tops the list. That's just fantastic. No wonder our trade deficit is improving. Foreigners finally found something of ours that they want (and they are apparently bidding it up). I can feel the prosperity slipping away, can't you? Note to self: remain stagflationary.